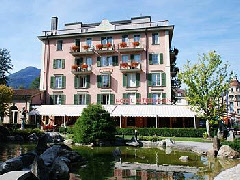 First mentioned as a hotel in 1323, it was known to be a guest house almost a century earlier. Naturally, much has changed since then – in 1491 it was extensively renovated for the first time, though part of the original wall can still be seen in the lobby of the hotel. The hotel is rightly proud of its connection to two of the nineteenth centuries most notable creative geniuses: Felix Mendelssohn, and Lord Byron. The latter is believed to have stayed at the hotel in 1816. Four-star rated, the hotel features 60 guest rooms.